I think Heiwa is trying to say that the initial recoil is simultaneous with the opening of the nozzle, and so it is not really dependent on what the water does in the air. In fact, it seems to me you cannot come to an agreement about this firehose issue because you are talking about two different stages in the process. A recoil only occurs when you fire a gun and a bullet leaves the gun. It is a short lived force created by the ejected bullet. When the bullet has left the gun the force of the bullet on the gun is 0. The air friction force acting on the bullet cannot push the bullet back into the gun (as suggested by sceppy). When you allow water to leave a tank, e.g. via a hose, the water ejected applies a force on the hose/tank and this force is there as long as the water leaves the tank. It doesn't matter if the water is ejected into vacuum, air or water. The force acting on the ejected water cannot push the water back into the tank. 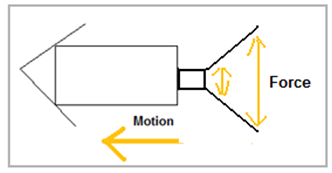 If the water is ejected into vacuum or space no friction forces will act on the water. Etc, etc. The gravity force acting on me sitting in front of my PC is about 840 N. Luckily the chair I sit on apply an opposite force af the same magnitude, so I do not fly up or drop down. I cannot see these forces but I am convinced they are there. The chair applies a force of about 1000 N on the floor but again the floor applies the same force on the chair. What can the mass of the chair be? Heiwa wrote: So you really say that the air pushes the water stream back into the hose again and then apply a force on the fireman. Suggest you join some local volonter fire brigade and test your theory. The water stream does not push any water back into the hose. It simply pushes back against the water coming out. It's a fight between expelled water and air pressure. Have you ever tried to stop a high pressure water leak with your finger? You will notice that you can't quite stop it, because the force against your finger is too great for you to fully seal the hole. In your firemans hose... the cold water streaming into the air is immediately forcing the air to part. Sort of cutting a tunnel through it...but the air at 14.7 psi will clamp on it, causing friction. The more water pressure that can displace more air, or make a bigger tunnel through it...the more the air that's been displaced will clamp down on it.It's always action/reaction, 'equally'. The stronger the water is, the more easily it can tunnel through the atmosphere but it gets weaker the further it goes which is why you see it fan out into a spray because the pressure of the atmospheres agitated molecules are ploughing through the weakening power of the water molecules and creating a more dense barrier against them. So what we have... is the air pushing through...over...under and around the weakening water from the far away end which starts right after the centre point of the arc. The stronger water pressure from the nozzle to the centre of the arc, is having it's dense water molecules squeezed, creating the friction which makes the water molecules smash into each other, so it sort of creates a high speed convoy wagon crash in a tunnel type scenario with one hitting the other and creating a tail back for as long as there are wagons moving. Hopefully, someone will make sense of what I'm saying. I'm trying to make it as simple as possible to understand. sceppy wrote: The water stream does not push any water back into the hose. It simply pushes back against the water coming out. It's a fight between expelled water and air pressure. Evidently there are friction forces between the water ejected into the air and the air itself. Anything moving in air is subject to friction. Have you ever been walking against a strong wind? But where does the force come from that pushes the fireman holding the water ejecting hose backwards. Friction between expelled water and external air? Pls make a new sketch how it works! How does this force between ejected water and external air reach the fireman? If you really think about it. The way you believe the hose works, cannot work at all. You say the nozzle is smaller and the pressure greater coming at it, right? well that would have the exact opposite effect to what you are saying, because the water would actually force the hose forward not backwards if it wasn't working against an atmosphere. 1. Newton did not consider gasses, nor their effects, when developing his laws. NASA believers need to address the fact that gas does not exist in absence of pressure. As such Newton's Laws can't be applied to gas in the vacuum. 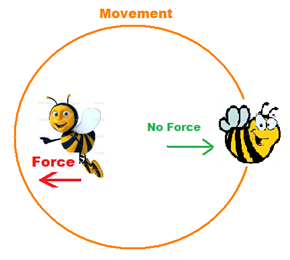 A system cannot "bootstrap" itself into motion with purely internal forces - to achieve a net force and an acceleration, it must interact with an object external to itself. A rocket in space is a single system without an external force. A rocket in space cannot interact with the vacuum. A bullet shoots out of a gun because the gas pushing it is external to the bullet. If the gas were inside the bullet and never left the bullet wouldn't move. Rocket exhaust in space isn't expelled or ejected. It simply ceases to exist once it leaves the nozzle because gas can't exist in the vacuum(it becomes unconnected molecules spread out across the universe). Boethius wrote: 1. Newton did not consider gasses, nor their effects, when developing his laws. NASA believers need to address the fact that gas does not exist in absence of pressure. As such Newton's Laws can't be applied to gas in the vacuum. I'm no scientist but it makes sense that gas does not exist without pressure. But inside a combustion chamber there is gas. I’d like to know more about the process by which it shifts from existing to not existing. Can gas on a pressure tide spin a windmill? Blow leaves? Would space leaves in the rocket tail-pipe, vacuum-side of the equation, be knocked into motion by the escaping mass? 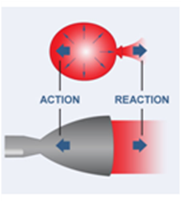 …this figure illustrates how a rocket nozzle works… The nozzle itself gradually increases in cross-sectional area allowing the gases to expand. As the gases do so, they push against the walls of the nozzle creating thrust. Do I get it? Could FE permit this, even if other logic forbade it? If wouldn't work for the balloon, either, unless that floppy thing really acts like a precison bell end. How does gas even move under these circumstances? If the porthole breaks at 40,000ft, nobody is swept towards the equal and opposite side of the plane - everything heads for the hole. So what is propelling this thing? I sense that many people are not aware of aerodynamics - and the forces involved when it comes to moving an object through the air - i.e. our atmosphere. NASA certainly isn't, since they keep repeating that their rocket exhausts do NOT interact with air/atmospheric pressure whatsoever. So let me illustrate in the most simple way the little I know about aerodynamics (having worked in Formula1 racing where millions are spent in dreafully expensive wind tunnels to combat and harness the pesky, tremendous forces of air - by highly paid engineers who spend their lives at it). Wow! 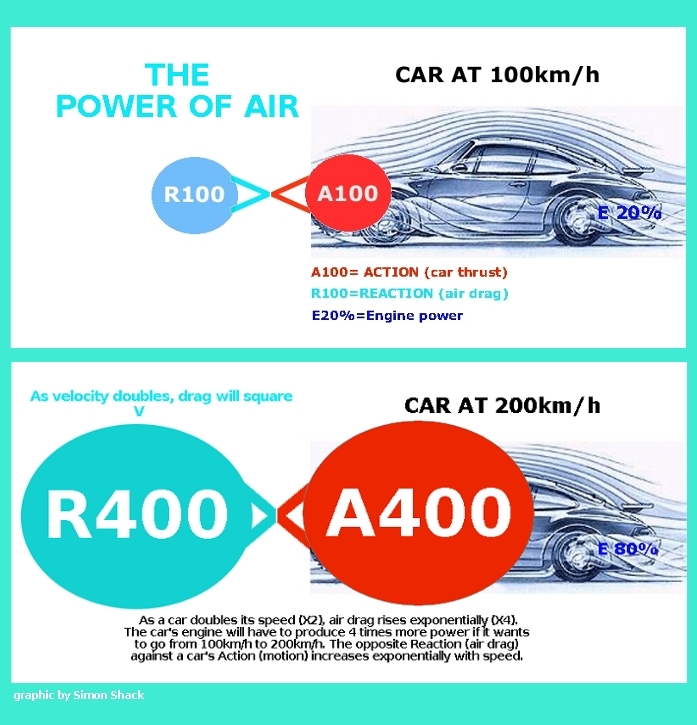 It sure looks like AIR will produce a massive REACTION (drag) to the ACTION (motion) produced by a moving object - such as a car trying to accelerate against it. Now, try to imagine - "inversely" - this car as the constant, ACTION force produced by a rocket exhaust thrusting a jetflow at 4.4km/s (16.000km/h) - the speed at which NASA says their hydrogen/oxygen exhausts exit their rockets. Feel free to compute your own calculations as to how much REACTION FORCE the air behind the rocket would fight back with. Can you see now how AIR REACTION propels rockets in our atmosphere? It should be obvious that the aerodynamically exponential REACTION force of air - against the ACTION force of the rocket exhaust - is the primary and essential force which pushes rockets up in the sky. Yet, NASA claims that their rockets are propelled by 'recoil effect' ONLY - caused by the rapid ejection of fuel mass from the rocket's fuel tank. The reason why they keep peddling this silliness should be easy to fathom: since air pressure gradually drops to zero at higher altitudes, no rocket (no matter how powerful) could possibly continue to ascend: the forces of gravity will eventually surpass/dwarf the dwindling REACTION force of the thinning atmosphere versus the ACTION force of the rocket's exhausts. ANY rocket reaching this physically infrangible boundary will just plummet back to Earth. Mankind simply cannot overcome this elementary law of nature any more than pigs can fly. Moreover, even if the rocket - by some miracle - reaches the vacuum of outer space, its pressurized gases will quickly be nullified/equalized by the overwhelmingly superior forces of the infinite, airless void of space. The entire space industry is a massive and ongoing fraud. Nicely put, Simon. Air surely has to must be part of Earthbound rocketry, whether they know it or not. Surely? If I understand, rockets don’t generate recoil ever. One may contort the chamber to apply pressure, but this is merely to prise open the hatch. Once the seal is broken, the exchange is without further effort. When internal pressure drops below ‘sphincter release minimums’, engine cut off. Gas is not launched, it escapes. It is already pushing back and stops doing so when the door opens. There’s no recoil with rockets, I reckon. Though there is the air effect you explain so well. I'm no scientist but it makes sense that gas does not exist without pressure. But inside a combustion chamber there is gas. I’d like to know more about the process by which it shifts from existing to not existing. I say gas ceases to exist because just about every formula, property and function of gas requires you to know the pressure it is under. When that pressure is 0, all those laws, formulas and properties are invalid. Shooting gas into the vacuum of space is like shooting ice cubes into the sun. idschmyd wrote: Can gas on a pressure tide spin a windmill? Blow leaves? Would space leaves in the rocket tail-pipe, vacuum-side of the equation, be knocked into motion by the escaping mass? You're talking about "Pressure Thrust", where the gas presses against the nozzle, or against other gasses caught in the nozzle. It's a relatively new theory about how rockets work in space. I find it curious that after nearly 100 years of claiming that a rocket only needs to push against itself a new theory springs to life. It's like someone coming up with a new theory about how cars work. The volume of the nozzle on an F1 engine like they used for Apollo is only about 5.5 cubic meters so even if you can produce this effect we're only looking at generating a few meters worth of thrust. idschmyd wrote: How does gas even move under these circumstances? If the porthole breaks at 40,000ft, nobody is swept towards the equal and opposite side of the plane - everything heads for the hole. So what is propelling this thing? I'm not really sure what you're getting at here. simonshack wrote: The entire space industry is a massive and ongoing fraud. It's kind of like a lie that was told that was so big that nobody can untell it which is the way frauds like Bernie Madoff explain how they ended up in so deep. The space industry is marketed as science yet it's impossible for anyone not involved in the industry to prove, repeat, observe or verify any of their results. It's not science, it's a mystery religion. 1. How do we know space is a vacuum anyway? What is the evidence for this? 2. If gasses were sucked into a vacuum of outer space then how does the earth have an atmosphere when the moon has none? 3. How the hell do they test rockets operating in a vacuum to scale- it is like doing aerodynamics under water! 4. The whole MEME of "Rocket Scientist" to me smacks of ineffable, arcane priestly knowledge that is incomprehensible to lay people no matter how hard they struggle to understand. Thanks for reply and responses. The hamster ball for bees? Not sure. May have been a comment on this from howthingsfly online. It says, ‘one things goes one way…’, which is about as far as the science of space travel has got here. The science of no-space travel is way ahead. Newton's 3rd Law: action/reaction only works if you have two separate objects. More specifically these two objects have to be external to each other. You can pull a weight off the floor that weighs as much as you because it is external to you. The combustion chamber of a rocket in space is internal to the ship. They are one object just like your arms are internal to your body and are one object when it comes to Newton's 3rd Law. The rocket has to do the same thing if it wants to move. It has to push or to pull on something external to the ship. There is nothing in space to push against or to pull on. You can exert as much energy as you want trying to lift yourself off the floor but if you don't connect to an external system you're not going to move. You may shake but you won't rise off the floor. Same goes for a ship in space. You can combust all the gasses you want. If you don't generate an external force you're not going anywhere. People say "the ship is pressing on the gasses" but the gasses don't exist outside the ship. Gas doesn't exist in the vacuum. So the ship is left pressing against itself. A space ship is like a car with an engine but no wheels. Every machine that moves is mechanical: relies on friction, pressure, exchanging energy with objects external to it. Everything except space rockets, that is. NASA might as well scrap rockets and go straight to saying we can teleport to the moon and other planets. Imagine a ship in space consisting of two parts A and B each with mass m. Thus the space ship A+B has mass 2 m. The space ship has a little internal mechanism, e.g. a spring, that can eject part A away from the space ship at velocity v leaving space ship B alone. When the mechanism is activated and applies a force on part A, space ship B gets velocity -v. Newton, you know. I can evidently replace my mechanical spring by a liquid that burns producing a hot gas that ejects part A. That's why my space ship works in vacuum. Problem is that I have to get rid of part A every time I want to change velocity so my space ship gets smaller and smaller in the process. Heiwa wrote: Imagine a ship in space consisting of two parts A and B each with mass m. Thus the space ship A+B has mass 2 m. The space ship has a little internal mechanism, e.g. a spring, that can eject part A away from the space ship at velocity v leaving space ship B alone. When the mechanism is activated and applies a force on part A, space ship B gets velocity -v. Newton, you know. Maybe you’re right about your hypothetical situation, but you don’t have a ship with two parts A and B. You have one part full of gas. It seems not to eject the gas. It doesn’t push it out. It just opens the hatch and away goes the gas. No contorting, firing, pushing straining or launching: gas exits without effort and it doesn’t push back. No propulsion without atmosphere. Newton!